Is Demat Account Required For Mutual Fund Investment? Home > Investments > Is Demat Account Required For Mutual Fund Investment? ‘Is Demat account required for mutual fund’ is one of the many questions that bogs a new investor down. A question like this not only confuses a new investor but also delays the investor’s decision to begin their mutual fund investment journey. Therefore, a short answer to this question is – No, you do not need a demat account to buy, sell, and manage your mutual funds. You do need it for stock market investment, but the advancement in technology has removed the compulsion of having a demat account for mutual fund investment including SIP. As mentioned above, a demat account is not necessary for a mutual fund investment, yet some people like to use it to manage all their investments from one place. Normally, people use the same demat account for their mutual fund investments that they have been using for investing in dematerialised equity shares. These demat accounts are registered with depositories like National Securities Depository Ltd (NSDL) or Central Depository Services (India) Ltd (CDSL) via depository participants (DPs) like ICICI Direct, Zerodha, etc. A depository is a financial institution that works as a link between the listed companies that issue shares and shareholders. It allows investors to transact in securities like stocks and bonds in electronic format without involving any kind of physical certificate. There are two depositories in India: NSDL and CDSL. These SEBI registered depositories were created through the Depository Act Of 1996 in 1996 and 1999 respectively. NSDL is backed primarily by National Stock Exchange (NSE), Industrial Development Bank of India (IDBI), and Unit Trust of India (UTI), whereas, the main promoters of CSDL are the Bombay Stock Exchange (BSE), State Bank of India (SBI), Bank of Baroda (BOB) and Bank of India (BOI). Brokers offering demat account needs to be registered with either of the two depositories. Why Does One Need a Demat Account? 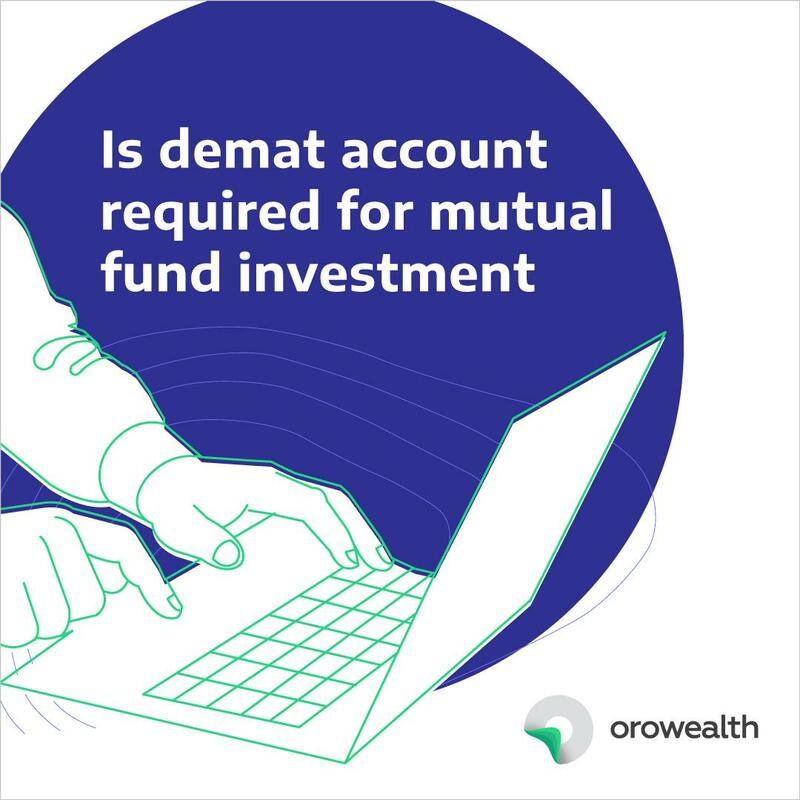 Although a demat account is not required for mutual funds, there are certain benefits that make an investor think about opening a demat account and manage all their investments through it. Some of the benefits of a demat account are listed below. A demat account eases the process of buying, selling, and managing mutual funds. It provides a centralized dashboard to manage and transact in various funds across AMCs. It offers a single statement for all MF holding across AMCs. Adding and managing nominee is easy in a demat account. However, there are some minor drawbacks associated with demat accounts. These shortcomings may affect the returns you hope to generate from your mutual fund investment. Some of the reasons are listed below. Why You Should Avoid Having a Demat Account for MF Investment? There is a yearly cost associated with the maintenance of the demat account, which adds up for a long-term investor. There is an upfront commission of 1% to 1.5% on funds that one buys through a demat account as it only allows you to invest in regular mutual fund schemes. There is a trail commission of up to 1.5% on the funds you hold in a demat account. This is charged every year for the entire duration of your investment. It adds up to lakhs of rupees in the long run, depending on the amount and duration of the investment. You can add only one nominee to your demat account. If you want to distribute your holding midst various family members, you cannot do it with the help of a demat account. Demat account is not the only way to invest in mutual funds. You can do it via your bank, a personal advisor, or through a third-party online portal like Orowealth, etc. You can use any of the following channels to invest your money in a mutual fund scheme. You can walk into your local bank and meet your relationship manager to begin mutual fund investment including SIP. You can also visit a local CAMS office to start your mutual fund investment. Alternatively, you can visit myCAMS website or download myCAMS app to begin investing in various mutual fund schemes – both in direct and regular options. In many cities, major fund houses have their branch offices. You can visit an AMC’s branch office in your locality and invest in one of its schemes. You will need to visit each AMC’s office individually should you wish to choose funds from different fund houses. Another way to invest in mutual funds is to visit each fund house’s website, register there, link the bank account with the portal, and begin investing. You can also buy mutual fund via a personal financial advisor, who may charge a certain fee (or a percentage) on each investment you make. There is yet another way to invest in mutual funds, which online third-party portals like Orowealth. It allows an investor invest in direct mutual fund thus saving upfront commission of up to 1.5% and yearly trail commission of 1% to 1.5 %. It also provides a centralized dashboard to help investors manage their investment portfolio across fund houses. You can use its dashboard to see all your mutual fund holdings in one place. As evident from the above discussion, both long and short answer to the question: ‘is demat account required for mutual funds,’ is a resounding no. It is not only optional, it also costs a great deal in commission when a mutual fund is bought via a demat account.